Get it in 1 week! Lowest price in the city! Click here! Based on a 2,850 sq. ft. house located in North California. Pre-audit yearly energy cost: $4,155. Post audit yearly energy cost: $3,025. In most buildings 5 to 35% of the energy is wasted. Our energy auditors are trained to comb buildings searching for these inefficiencies. 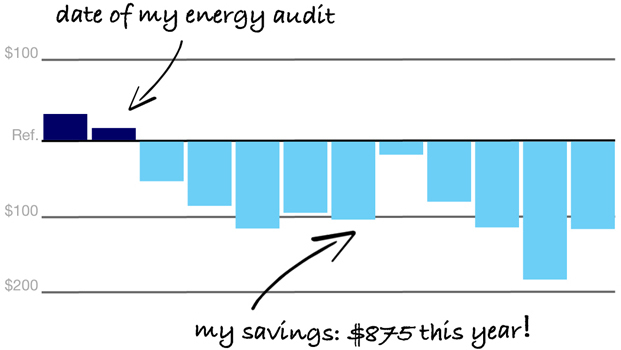 Right after their energy audit, most of our customers save up to 10% with no-cost measures. Most building managers and home-owners don’t know how their place is performing. An energy audit will benchmark your place with similar ones, following industry and EPA standards. You can compare your results to the best-practices. Should I change my windows? Insulate more? Go solar? There are many ways to save energy. Some are much more beneficial than others. Learn about the best measures for your place, based on their Return On Investment (ROI).